This summer I spent a lot of time reading about the impact of play on children’s development. Current research cites examples of how play positively correlates with language and literacy skills; how it exercises children’s executive functioning (the part of the brain that controls organization and decision-making), how it improves children’s ability to negotiate and be flexible with others, how it enables the capacity to self-regulate, and on and on. Play addresses the whole child – physical, cognitive, social and all. Child development theorist Jean Piaget claimed that “play is the work of children.” What he meant was that children learn best through actively exploring and discovering through their own self-directed activity. Unstructured play can make some educators uncomfortable. It implies chaos in the classroom. And indeed, there is some level of (constructive) chaos that is part of any productive play. Oftentimes, children need guidance on how to play before they can be successful on their own. They may be inexperienced in how to enter play. They may need help understanding how to extend a narrative story line in imaginary play. They may need reminders to share or take turns. It’s a fine line for the teacher to tow between too much and too little interference in children’s play. Only when they face conflict and challenge on their own will they be able to reach a new level of mastery. If we assume that play is the work of children, there is no limit to what can be taught in this context; how children’s minds can be stretched and how cognitive (not only social/emotional) growth can be realized. With so much pressure placed on young children these days to demonstrate academic, rote learning and standardized testing being presented earlier and earlier, the role of play is more important than ever. I always tell anxious parents who are worried about pre-reading and math skills and where their child fits in on the academic spectrum, that we sneak these skills into play. Only then are kids interested and only then is it really developmentally appropriate. Play is where you find kids fully engaged. Play is where kids have some level of control over their lives and interests. Play is where kids push themselves to the edge of what is comfortable and familiar. Play is where risks are taken and messing about happens, and failures and mistakes turn into powerful “aha” moments for kids. What does learning through play look like? It looks like kids measuring and weighing liquids at the water table. It looks like kids examining the details of a pinecone with a magnifying glass at the science table and then rendering a drawing of it. It looks like a group of kids building a movie theater out of blocks and then negotiating which movie they will show. It looks like kids pretending to be at a restaurant, complete with chef, servers, and patrons as well as child-created menus. It looks like kids patiently taking turns to do a puzzle together. It looks like kids covered in paint as they experiment with color mixing. Each of these scenarios is ripe with learning across many domains. Letters and numbers and physics and estimation and geometry and chemistry and concepts of cause and effect …. children are exposed to it all through various kinds of play. Play allows the process of learning to take place organically; enabling each child to take on what he/she is developmentally ready for. The teacher’s role is facilitator, at times arbitrator. But the classroom experience should belong to the kids at the end of the day. Only then, can the magic of play be transformed into real learning. 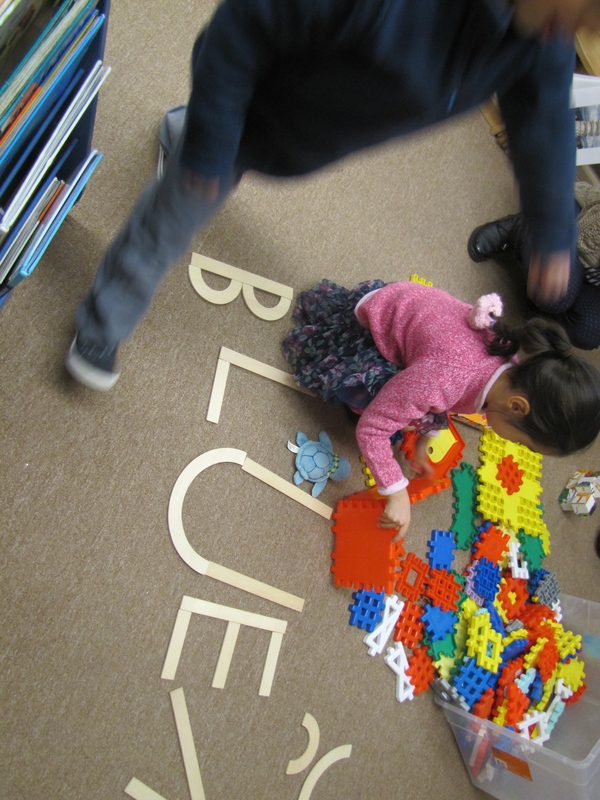 There is probably no subject more important for the preschool experience than play. As this blog posting so beautifully describes, play helps children grow. Even without “sneaking pre-math and literacy skills into play”, play creates the foundation for academic learning. Some parents think that if their children have big vocabularies or a large fund of concrete facts or are facile with letters or numbers, they will do well in school. This is not necessarily the case. Even though children who have these skills are demonstrating talent, in order to succeed at school children need much more. They need a flexibility of mind to move from one mental concept to another in order to perceive their relationship and expand their meanings. They need the patience and persistence to continue to explore a problem in order to arrive at a satisfactory solution. And they need, as Kate explains, the relationship skills to collaborate with others in order to bring together different perspectives and create complexity. Free play alone and especially with other children can help children learn these essential competencies.